Today I got an email from Google Search Console. 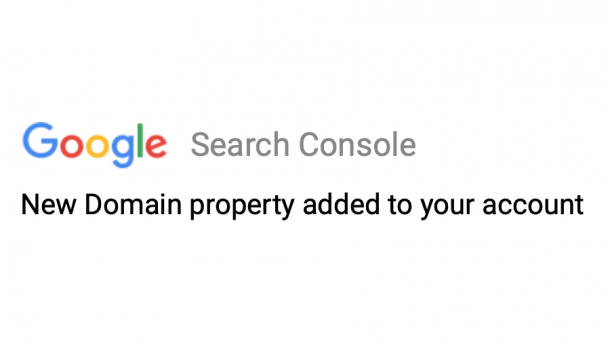 Now it has the new feature called “domain property.” For those who have multiple subdomains registered in search console, it might be interesting. 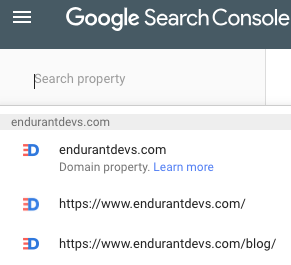 Search Console Team plays with a new type of web property to simplify the work of webmasters with big websites. If you have a few instances like http://sub.domain.com, httpS://sub.domain.com, and http://www.domain.com you’re able to see the summarized information for all protocol and sub-domains data on domain entity of “domain.com.” So, you can see stats for a group of web entities of one domain. Pretty cool, ha? More information about domain properties is available at support.google.com for webmasters article. In the future, it will be allowed to create new domain properties based on websites connected to the account. However, this feature is experimental now. It is available only for invited people. The “Great Random” chose our team’s site about software development for startups. Once I saw the domain property feature, I thought this would be available in Google Analytics. It would be cool to get combined stats in GA, including Adsense data. It could be helpful,… but nope. The feature will be available only for Search Console. There are some logical limitations also. There will be no ability to change property setting or work with sitemap tools. The team of Search Console is doing a great job this year. I do not remember many changes in this Google product before. Maybe the team got a new product manager, or it was allowed to spend resources on this product to beat Bing thoroughly, who knows? It would be cool to check domain property for web entities with 100K+ pages. I guess, that such functionality will be beneficial there. The question if it doesn’t slow down stats counting. The current time lag for data appearance is the thing I like the least in Google Search Console. Originally published at www.endurantdevs.com on November 8, 2018.